Math Mammoth Grade 2, South African Version is a complete maths program for 2nd grade. It consists of two student worktexts (A and B), a separate answer key for each workext, tests, mixed revisions, and in the download version, an additional worksheet maker (Internet access required) to make extra practice worksheets when needed. Describing and analysing shapes (chapter 5). 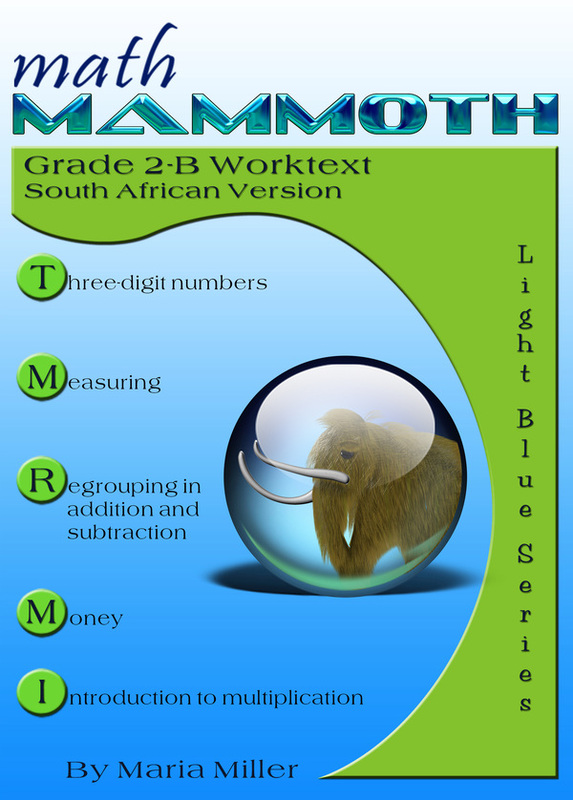 Please note that the curriculum is not following the South African official syllabus for 2nd grade maths. 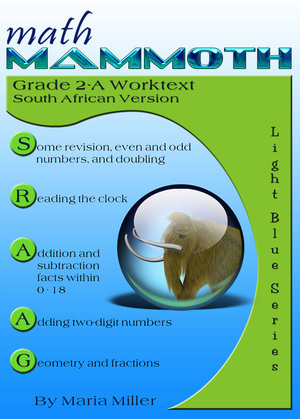 Instead, it simply is a copy of the US version of Math Mammoth Grade 2. For the most part, Math Mammoth exceeds South African standards. Some standards may not be covered. A non-digital clock or other analog clock where you can turn the minute hand and the hour hand will turn accordingly (for 2-A). A ruler that measures in centimeters (for 2-B). A bathroom scale that weighs in kilograms (for 2-B). Base ten blocks to illustrate place value with hundreds (optional). The worktexts have pictures that are just like base-ten blocks, and most children can understand the concepts from the visual representation, without a physical manipulative; however for some children the actual blocks can be beneficial (for 2-B).